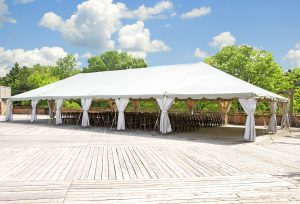 Tent rentals are an elegant and cost-effective solution for outdoor events in Atlanta, Georgia, ranging from intimate birthday parties in the park to large corporate events. With more than 30 years of experience, Atlanta Event Rental has proudly served local residents by offering a wide selection of high quality tents for rent. As a customer-centric business, we provide a hands-on approach to ensure all our tent rentals go off without a hitch. Our owner even oversees every project himself from start to finish. At Atlanta Event Rental, we offer a large selection to suit virtually any occasion. For example, we can provide you with frame or pole tent rentals that range in sizes from 10 feet by 10 feet to 60 feet by 200 feet. This means that no matter how many guests you have invited or where you plan on placing your tent, we will have an option that works for you. Plus, our tent rentals can include beautiful liners, which will conceal any framework to create an elegant, enclosed space for your guests to enjoy. What’s more, our team of professionals will provide prompt delivery as well as installation and removal, so that all you have to worry about is enjoying your party. And, we are available for delivery and installation 365 days a year to accommodate parties of all types. For more information about the tent rentals and other party items that we can supply for your event in Atlanta, GA, or a surrounding area, contact Atlanta Event Rental today. When you do, a knowledgeable member of our team will happily answer any questions you may have about our services.